Are You A Spiritual Channel? 7 Signs You’re Already Channeling! Are you a Spiritual Channel? While channeling sounds mystical and esoteric, and it certainly can be both of those… many people have opened to channel without even realizing it! Do you on some level already know How to Channel? In this article, I’m going to share with you the 7 Signs You've Already Started Channeling, so you can discern for yourself, whether you’ve unknowingly tapped into the spiritual channeling state. But before we look at the 7 Signs, let's take a quick glance at what channeling actually is. Spiritual channeling is first and foremost, speaking the messages of divine love. In every moment, we are all connected to the divine and connected to the infinite. We each have an incredible amount of support, love, and guidance available in the higher realms of spirit. Channeling is when you tune into that guidance and allow it to flow through you. There are certainly different ways, methods, and types of channeling … You may find that you naturally channel healing energy, creativity, or you may spiritually channel messages of love, profound wisdom and divine light. I've already written about the three types of channeling here. Intuitive Channeling is the most common type of spiritual channeling that people inadvertently open up to, so that is what we are going to look at now. Intuitive channeling is essentially when you connect with the messages of divine guidance, and the stream of divine love in the moment, and you begin to flow it through you intuitively, often without even realizing it. The reason you may not recognize when you’re intuitively channeling is that guidance and frequency received while intuitive channeling, intermixes with your own stream of consciousness. So while sometimes called clairvoyant or clairaudient channeling… You're not really hearing or seeing the guidance… You're just speaking it and flowing it through. And really, depending on who you are what you are channeling, this is an opportunity to live in alignment more with the truth of you channeling your true divine nature, channeling your highest divine light and highest Divine Self. Through this, you’re able to begin living in the channeled state, which means living in alignment with the path of love with your mind clear in your heart open so that you're clearly able to reflect the higher light of Spirit through your life. And to allow Divine Love and Guidance to be transmitted through the words you speak and the energy you allow to flow through you. 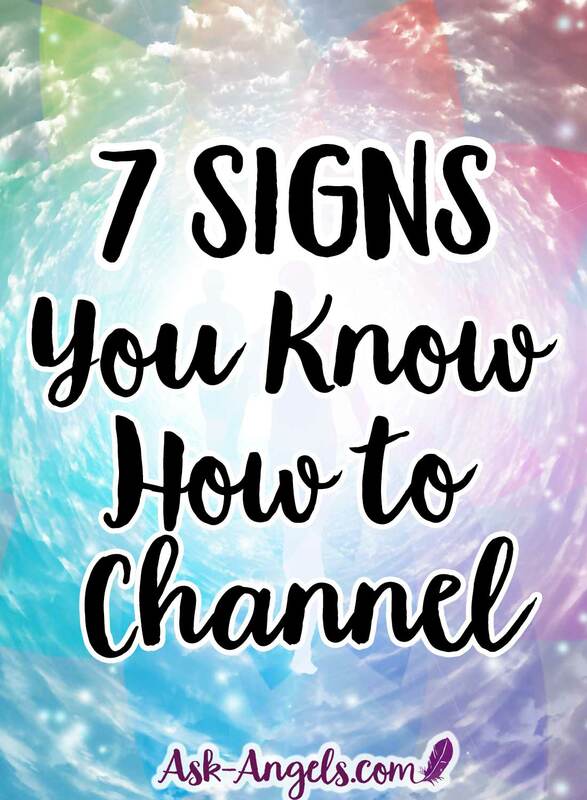 Okay, so let's dive into the seven signs that you already are spiritually channeling and that you already know how to channel, whether or not you realize it. You Find Yourself Writing or Speaking bout Topics You Don’t Logically/ Consciously Understand. The first sign you’ve already had an experience Intuitively Channeling is that you’ve found yourself flowing, speaking or writing divine guidance, messages of love, comfort, inspiration and wisdom that you haven't fully aligned with at a conscious level. This flow of Divine Guidance may spontaneously begin when you're talking to someone, and your own stream of thought is going in one direction, and then suddenly, divine guidance and brilliance begins to flow through you. When this happens you’ll likely have a feeling deep down where you know and recognize that what you're saying or what you're writing is truth. And yet you don't know how you know it, or perhaps even where exactly it's coming from. With discernment, and through developing your ability as a channel, you can learn to identify the source of the guidance, which is really a key factor in recognizing whether that guidance is trustworthy and should be acted upon. But at first, it is normal for guidance to just start flowing through. So that's the first sign that you already are channeling. It's that you've just gotten in that flow of streaming guidance from beyond your logical comprehension. The second sign you are an intuitive channel is that you find you have sudden flashes of insight, inspiration and higher divine guidance that comes from a source that feels “outside of you”. So this doesn't necessarily feel like a deep remembering. It's more like a flash of inspiration and divine guidance from above, from your guides from Source. Perhaps it may even feel like you’ve just received guidance and inspiration that “came out of nowhere”. This experience of receiving flashes of divine guidance, inspiration, or downloads of information in an instant, is one of the signs that you are opening to channel. You’re Able to “Drop-In” To A State That Allows You To Access Inspiration and Information. The third sign that you are an intuitive channel, that you've already channeled, and that you have the potential to further develop and open to this ability is that you’ve intuitively found an inner place of focus. Perhaps you’ve dropped into this place from the time you were a child, perhaps it really emerges in times of stress, or when you don't know what to do. But essentially on some level you’ve learned a way in which you’re able to refocus your awareness within, to tune in to guidance about what you should do next, to tune in to inspiration, to calm your mind and tune in to a stream of guidance, support, encouragement within. When you’re doing this, This is intuitive channeling! You are entering into the channeling state. This is a powerful skill and yet, so many people are doing this without realizing it. Another way of explaining this state is that you find yourself tuning into that feeling “deep down”, that everything's going to be okay. When you access that place of “deep down” intuitively, and naturally, you're often dropping right in to the channeling state where you're then able to receive a flow of inspiration, healing and wisdom. The fourth sign that you’ve opened to intuitive channeling, is that you naturally find yourself streaming guidance in a way that is uplifting and comforting for others. Specifically, you may be talking to someone and sharing something with them. And then what you’re saying shifts direction and you suddenly find yourself in a flow state, speaking a message of inspiration, guidance and love. Again, channeling can often be seen as speaking the truth of divine love. Sometimes when you're opening to channel, you may be talking about something else, and then suddenly, profound wisdom, insight and guidance begins to flow through you. With awareness, you can learn to distinguish these states of consciousness. Recognizing when you are speaking from your normal conscious mind, when you’re spiraling in doubt or worry, when you’re present centered and focused, and when you’re channeling. With awareness, you can consciously choose to open to channeling the Divine Wisdom of love to allow it to flow through you. But to start, it may be that you start writing an article or writing in your journal, and then suddenly, a message of encouragement of love and of support starts to flow through for you. When this happens, you're channeling! The fifth sign that you are an intuitive channel is that you have the ability to creatively channel artwork, music, lyrics, poetry, sculpture, anything creative really. This creative energy may in any different number of ways, the key is that you’ve somehow learned to open to it, and you allow yourself to be led by creative inspiration. Do you seem to have creative inspiration that comes out of nowhere? Creative ideas just appear and when you allow it flow through it, the creative process almost becomes effortless? You’re entering into a flow state where you're flowing with Divine Love and creativity to create something beautiful? This is channeling creativity. And yes, this is a form of intuitive channeling that you can further develop to make it more conscious and on demand to consciously channel artwork, beauty, writing, and energy through you. You also notice that there's a current of energy flowing through you. You feel energized, you feel alive, and you feel totally present. You may even feel like you're being filled up with light, and that light and love joy, healing, and blessings are flowing into… And then flowing out through your hands through your heart, through your energy field, to bless those around you to bless your space. The way that I find that this most often opens for people is in interacting with others. So when you're talking to someone, and especially if you’re offering guidance, comfort or support, you may begin to intuitively channel energy healing through you to them. When you feel this energy flow, of divine life force energy and love flowing through you in conjunction with any of the above signs, it is a clear sign you’re channeling. I do want to clarify though, that for some people… You may not even be speaking, and you still find yourself channeling energy. There are many people who are profoundly powerful channels, and yet they never speak the messages of Divine Love. Rather, they channel healing energy more so than words, streams of consciousness or even artwork. So yes, feeling that flow of energy through you, that is a sign that you already are intuitively channeling. Channeling energy healing is a beautiful and powerful gift. Finally, the seventh sign that you are already channeling is that you have opened to a flow of profound guidance, wisdom, healing and frequency beyond cognition. Through this you may be able to speak on and tune into insight about things that you haven't studied yet. But you just know deep down or perhaps from above, what you’re tuning into is in alignment with divine truth, divine love, and with healing frequency. Really, when you're truly channeling, divine guidance flows through you in a way that is just such a beautiful flow state, it unfolds almost effortlessly. It feels good to you while you're doing it, and you feel uplifted while you're doing it. You may lose track of time, or feel for even a moment that you’re entering into a state beyond time, or that time stands still. This happens because you are fully engaging and present in the moment with the stream of Divine Love, divine consciousness, healing wisdom, insight and guidance from the divine from the higher realms of spirit from love and allowing it to flow through you. How Many of These Signs Have You Experienced? Really, if you have experienced any of the above 7 Signs of Spiritual Channeling, it is a clear indication that you have some channeling ability, and that you can further develop your internal subtle sense organs to become a clear, conscious channel. The biggest difference between Intuitive Channeling and Conscious Channeling is that with Conscious Channeling, you deliberately and intentionally tune into the channeled state to with clarity and precision to bring through the messages of love and guidance from spirit and from the higher realms of love and truth. This course is from the same teacher I studied under when I was opening to channel! Hope this is helpful for you. 7 Steps For Connecting With Angels!